The Creative Mobility Group will be returning to DeVos Place for the 2017 Michigan International Auto Show February 2-5. 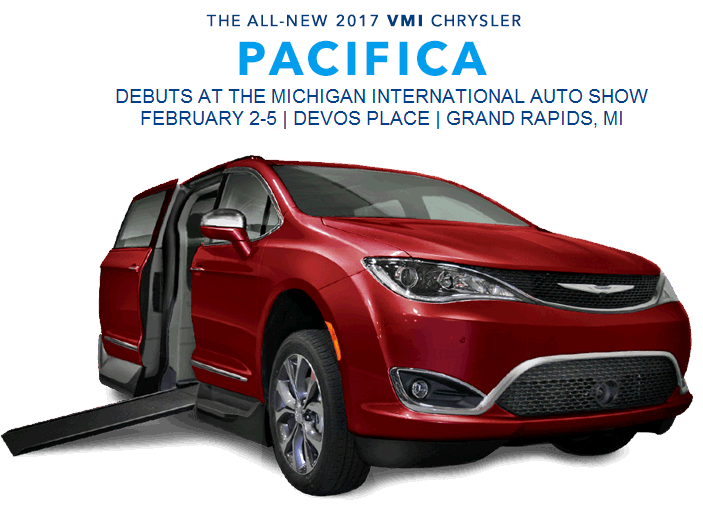 This year’s 600 square-foot exhibit will feature the all-new wheelchair accessible 2017 Chrysler Pacifica VMI Norsthar360. Attendees will also be able to schedule in-home demonstrations and test-rides for those unable to attend the show. Additional equipment on display will include vehicle lifts for power wheelchairs and scooters by Harmar Mobility as well as adaptive driving controls. Throughout the show, attendees will be able to speak to certified mobility consultants to learn more about adaptive vehicle equipment options available. The mobility consultants will also be able to answer questions regarding funding and financing programs available for adaptive equipment, including programs for disabled veterans. Attendees will also have the opportunity to claim a $1,00 Auto Show Rebate toward the purchase of a wheelchair accessible vehicle. The Creative Mobility Group will be located in Hall A, Booth 180. ATTEND THE SHOW COURTESY OF THE CREATIVE MOBILITY GROUP! The Creative Mobility Group has a limited number of free admission passes for our valued guests. Please complete the form below and you will receive your complimentary tickets in the mail. Tickets will be mailed on a first come, first served basis. If the free admission passes are no longer available, you will receive a buy one, get one free coupon in its place. Limit two passes per household. We will only use your e-mail only for its service and we will never give out your e-mail address to any third party.